One of the first posts I wrote for Be More with Less was The Story of the Mexican Fisherman. This story gave me great inspiration to simplify my life. It’s a story that was pinned to my bulletin board in my office, in my house, next to sales reports and goal sheets from my job, reminding me of what was most important. This little story inspired change in my life and work, and still makes me think about what matters most. It also encourages me to share personal stories and invite you to share yours. You have so much to offer the world by sharing who you are, what you’ve experienced, and what it all means to you. Even though I was working to make more and own more when I found this story, it kept working on me. When I’d look at my sales numbers, my eyes would run over these words. I wasn’t ready at first, but I was curious and then I was committed. If there is a story working on your life, give it room and take the time you need. It will be there when you are ready. In the Story of the Mexican Fisherman, a small boat provided a beautiful life. You don’t need an impressive title, big car (or boat), or big business to live a beautiful life and be a beautiful person. In my experience a smaller living space and fewer obligations has made life even sweeter. 4. You already have it all. If you have a nagging feeling that you could do better, make more, and deserve to upgrade, remember that the secret to having it all is recognizing that you already do. 5. Advice is nice, but intuition is better. The Harvard grad had plenty of advice, and we are faced with an endless amount of advice on a daily basis, but as Danielle LaPorte says so simply and thoughtfully, “it’s ok to want what you want.” Read, research and listen to advice, and then do what you know will be best for your life. If you don’t know, make time and space to listen, because you probably do know, but have been too busy/stressed/worried to trust your voice. 6. The time is now. Do you want to enjoy your work and life now or work a job you hate and endure a stressful life so you might find joy in 20 years? It has to start now. That doesn’t mean that everything has to change immediately, but start building joy into your life today. You deserve that. 7. You can’t put a price on a happy life. Not even a million dollars. 8. Spend time with your amigos. 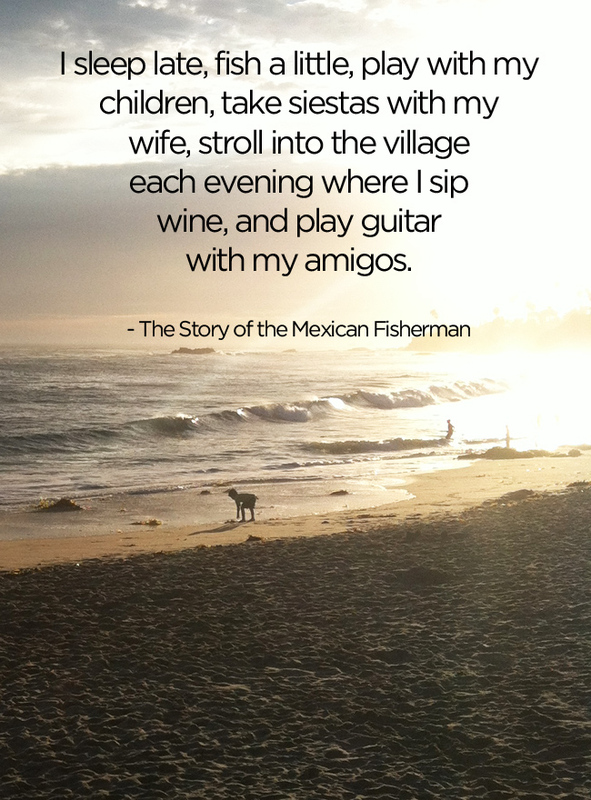 The wife, children and amigos were all an integral part of the fisherman’s life. Spend time with people who lift you up and quietly distance yourself from those who don’t. Catching more fish and growing the business was very logical advice, but offered little wisdom. In Arianna Huffington’s book, Thrive she says, “Ours is a generation bloated with information and starved for wisdom.” Aim to weed through the information for the wisdom. Usually that comes back to knowing what you know to be true for you. 10. Protect less and share more. This Story of the Mexican Fisherman was originally told by Heinrich Böll about an encounter between an enterprising tourist and a small fisherman on a European coast, in which the tourist suggests how the fisherman can improve his life. It’s been told, re-told and adapted. I’m so grateful that a version finally found me. Let’s keep sharing meaningful stories. I don’t have a bulletin board, office, or a house anymore. I don’t have the job with the sales reports and goals either. Instead, I have a happy marriage, thriving microbusiness, and time to enjoy coffee and writing with my amigos or a hike with my dog. Instead of a big job, big car and big expense account, I have a big, beautiful life and I’m so grateful. Live small so you can live big. Hi Courtney, I love this post! Thanks for sharing! What a great post! Fun and inspirational. Thank you for sharing this story again. I do remember reading it when you originally posted it, but it resonates even more with me now. This story inspires me to achieve my goal of a small and wonderful life! My father told me this story when I was a little girl, he’s the simplest man I know, a joy in my life. I’ve told this story to my husband and soon to my daughter. Thanks for the sweet reminder Courtney! This is awesome!!! Love that story. I will share it. I love this story! Does anyone have advice for #8 – particularly the part about distancing yourself from people who don’t. It’s hard enough to get rid of “things.” How do you quietly and gracefully get rid of the people in your life who are not bringing you joy? This is a great story. Kenny Chesney wrote a song based on this tale and I love listening to it too. This is so great! I am a new blogger, a hobbyist, fledgling writer and I love it! I love my little space. Lots of people seem so focused on growth that I wonder if just the thrill of pressing PUBLISH is gone too soon? Thank you for sharing this story and the lessons in it. Thanks for this post. I have never heard that story before but I really like it. Accepting the present for what it is rather than expecting something else is so important for happiness. Thanks so much for sharing this story…. I will be hanging copies of it everywhere now. It hadn’t even occurred to me to share this story with others. I’m so glad you did. I love this post. It reminds me of when my husband and I were in the Cinque Terre in Italy a few years ago in the lovely little beach town of Monterosso. Every morning this older gentleman who worked at the beach set up the chairs and umbrellas, singing “amore, amore” just so happy with what he was doing, assisting people on this small little beach on the Mediterranean. Every morning from our hotel room we would hear him singing “amore amore” when he was setting up and then singing again when he was taking everything down. Out of all the things we did on that trip, we remember this lovely Italian man so vividly, so happy with his work and with his life. Very similar to your story. Thanks for sharing this post. Love it! I’m hanging this on my bulletin board. Thank you, Courtney! The eureka moment for me was when I realised I didn’t have to be “doing” all the time. If it was sunny, I could take a book and a glass of cordial into the garden and lie around with the dogs. If it was snowy I could walk away from the invoices for a couple of hours and build snowmen and igloos with my daughters. Not being “busy” doing “constructive” stuff wasn’t just not bad, it was good, for all of us. What a wonderful story and to have it all! The simplicity to life …to live the life you want and you are happy with it as it is! However, respecting artists and their work, I felt it was important to say that this story was written by Heinrich Boll in 1963. It is called “Anekdote Zur Senkung der Arbeitsmoral.” I am not sure where you originally got the “Mexican Fisherman” story, but whomever wrote it stole it from Boll. It’s still a great story, but I felt the proper author should be credited. Hi Jason… please read #10. Proper credit was given to the author. Thank you for providing the title of the work. I did the #6 and then some. Worked 33 years at work I didn’t like, but I saved money so that some day I could chill and play the guitar so to speak. Which I did…. but then, I asked myself “Is this what life is about? Is this what I want to do? Chill? That’s it?” . So I allowed passion to take me. site contains remarkable and genuinely good material for visitors.